Baked Zucchini Parmesan is a gift from summer as well as a healthy meal that your whole family will enjoy. 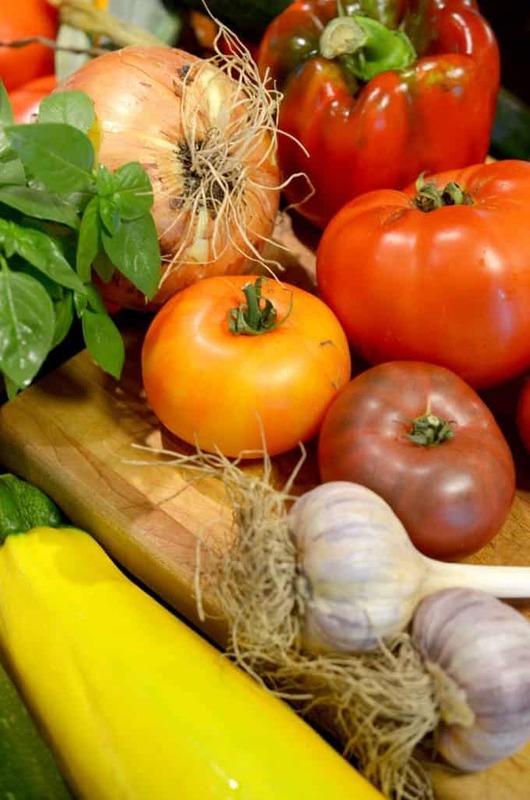 Farmers market-fresh produce make up this meal that is ultimately finished by a slow-cooked tomato sauce from the farmer’s garden to your kitchen table. This Baked Zucchini Parmesan is a farmers market fiesta. We can’t get enough summer although we will try to pack in as much of the warm green season as we can. It’s been a superb summer here in Wisconsin with lots of sun-filled days together with just enough rain and humidity to make anything that grows in soil thrive to its fullest. 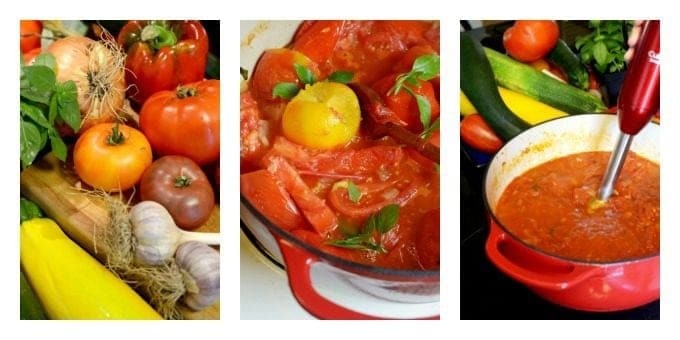 This recipe starts by making a simple but really good tomato sauce, and it’s all from fresh ingredients. One of the occupational hazards of running a food site is to sample and subsequently eat every single recipe that we feature. This may not sound like a problem to you, but if you had gained 30 pounds in the past few years as I have done, you might have a better idea of what I’m talking about. For this reason, I am trying to focus a bit more on healthy foods and substituting carb-ridden foods like pasta for things like whole grains and fresh vegetables. 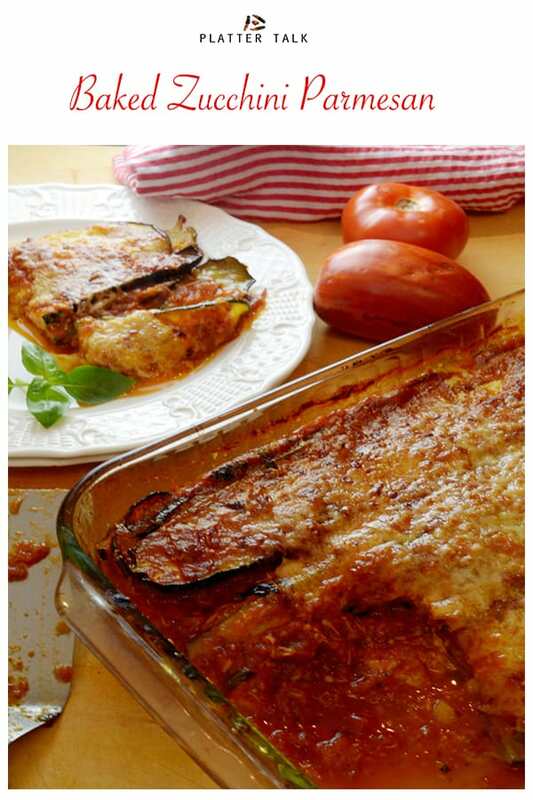 This zucchini parmigiana by and large does exactly that. In lieu of layers of pasta, we used layers of fresh zucchini instead. Speaking of zucchini, we have made a few other recipes that feature this gift of summer, you can read about them here. Baked Zucchini Parmesan is a fresh, seasonal meal as well as a recipe that the entire family will enjoy. Slice a long zucchini into 1/4 inch slices. Then, sprinkle liberally with kosher salt and allow to drain for at least 30 minutes in a colander that is placed in your sink. Briefly rinse the salt off of drained zucchini then pat dry with a paper towel. Brush each slice of zucchini with olive oil and then season with salt, pepper, and a pinch of crushed red peppers. 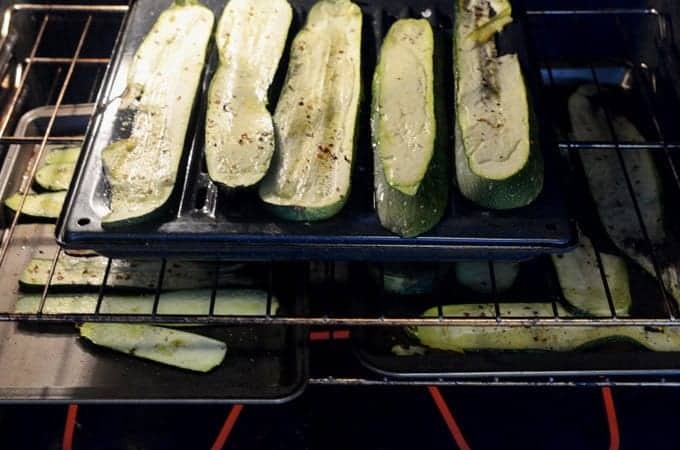 Next, lay the zucchini in a single layer on a baking sheet lined with parchment paper, and place in a hot oven to roast for about then minutes or until fork-tender and lightly brown. Roast the zucchini strips until fork tender and lightly brown. 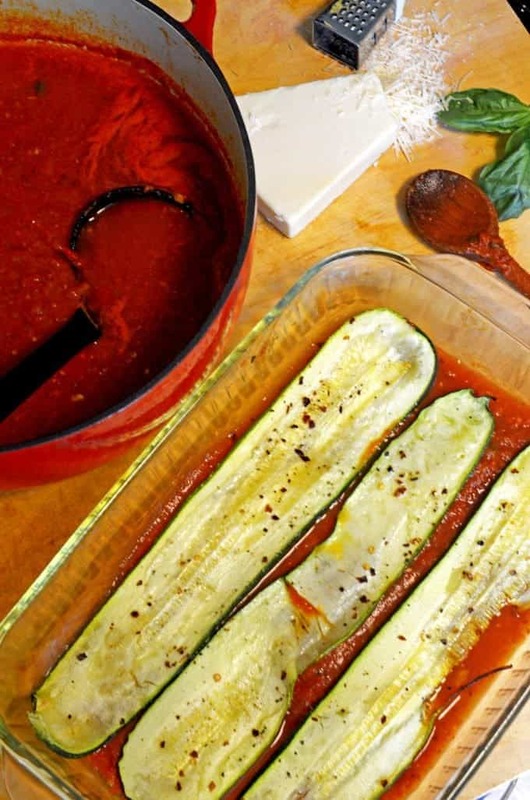 Once the zucchini are roasted, scoop a ladle of sauce and spread it across the bottom of a lasagna pan. Place a layer of zucchini in the pan, cover with sauce and then sprinkle with freshly grated Parmesan cheese. Repeat this process to finally end up with three layers. On the top layer, spread with sauce, more Parmesan, and then bake for 45 minutes at 350℉. Remove from oven, garnish with fresh cut basil, more Parmesan, and allow to set for 5 minutes before serving. We suggest a mellow Italian red wine with this. Montepulciano d’Abruzzo is one of our favorites and can be found for about $20 just almost anywhere. 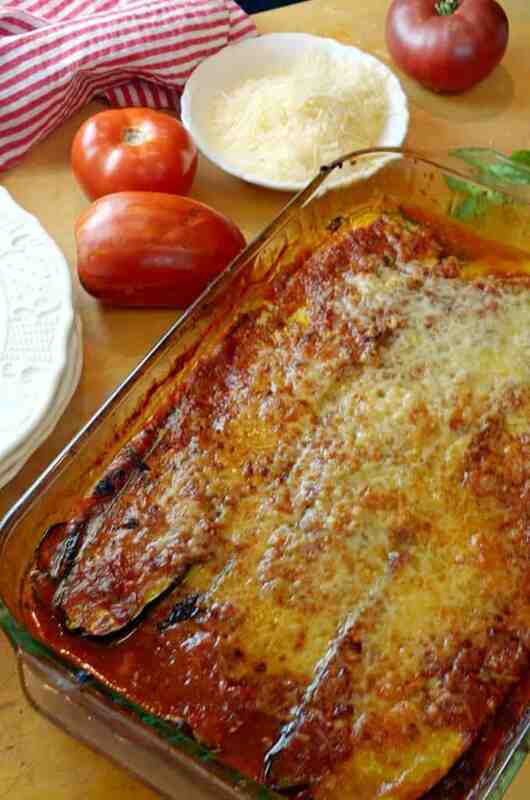 You’re going to want to try this Baked Zucchini Parmesan soon. It can be made any time of the year, but late summer and fall are when you can find fresh zucchini at any produce stand, farmers market, or better yet in your garden. It’s a fresh, delicious, and healthy meal that you will make again and again — wishing you and yours a delicious season, whenever it is that you may be reading this. 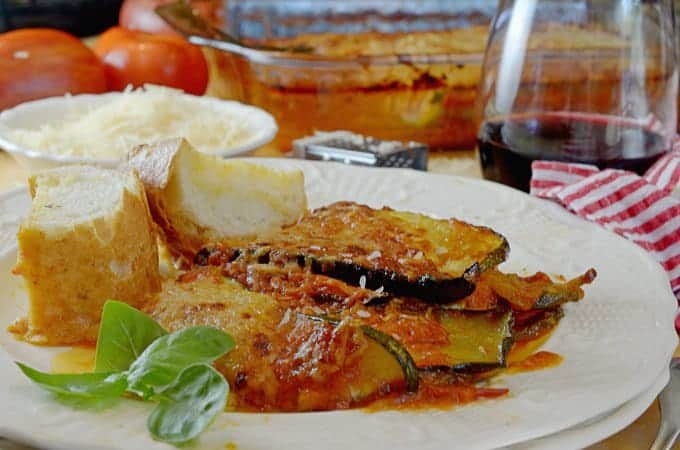 Zucchini parmigiana is a healthy and fresh seasonal meal. 1-2 lbs zucchini use long ones if available. Slice Zucchini into 1/4 inch strips and then place in a colander or in a clean sink and sprinkle generously with kosher salt. Allow the zucchini to drain for at least 30 minutes. Next, rinse off zucchini briefly then pat dry with paper towels. Using a rectangular lasagna-style pan or deep casserole baking dish, evenly distribute about 1 cup of tomato sauce in bottom of pan. 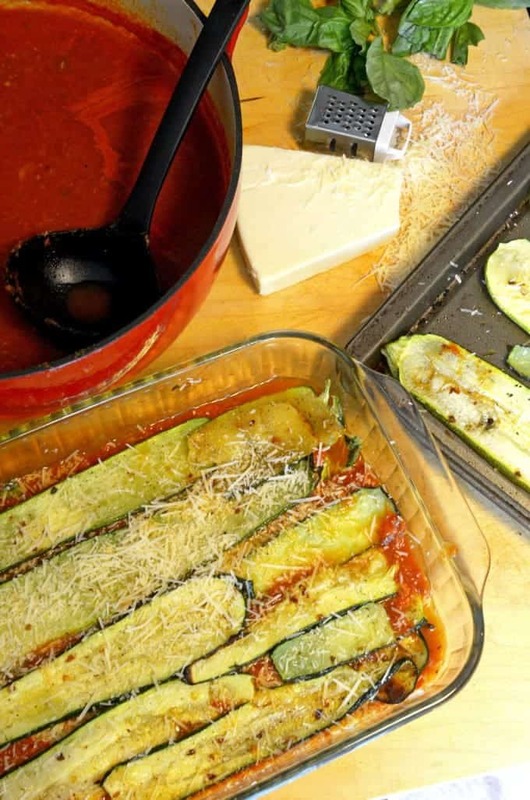 Place one layer of zucchini strips in pan and then top with a cup of tomato sauce and sprinkle with Parmesan cheese. Repeat this process for a total of three layers and then bake for 30 to 45 minutes until brown and bubbly on top. Remove from oven and then garnish with optional fresh basil and additional Parmesan cheese. Allow to set 5 to 10 minutes before serving. This looks great . I found 3 very large zucchini in my garden today and will definitely be making this today. Do you think it will freeze well. Thanks! Marilynn, I think you will love this use of zucchini. Thanks for reading Platter Talk and be sure and stay touch with us! Love the way you take photograph. The decoration of this recipe is great, Dan. I love tomato, and will try to make this soon. Thanks for sharing, Dan. 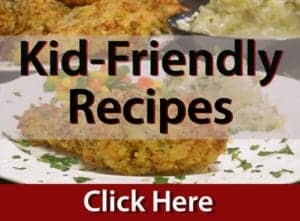 super easy and healthy recipe but unfortunately my son doesn’t like tomato,i wish he loves it so that i can make it for him. btw, thanks for sharing this, Dan. I’m crossing my fingers that he will outgrow that particular trait! This is the best zucchini recipe I’ve ever tried; zucchini nirvana! I’ve made it twice in two weeks and still can’t stop thinking about it. With the younger, smaller zucchini, I didn’t get much fluid during the salting, and skipped it the next time with no adverse effects. I was quite generous with the parmesan cheese. The red sauce is definitely worth making and a good way to use up your less than perfect garden tomatoes. Thanks Dan and Scott! Cari, you’ve made our day and I have to agree that this is a dandy of a zucchini dish. Next season we would love to run into you and your family, at the source of our produce – the EL farmers market! Enjoy the season and thanks again for the kind comments, it’s very nice to hear from you. Oh, Sylvia…this combo is so wonderful. I hope you try it soon. Thanks for stopping by for some Platter Talk! Bintu, we loved this dish from summer. Thank you for stopping by for some Platter Talk! I love this alternative to using pasta! This looks really good! I’ll be trying this out as I have some zucchini to use up this week! Amanda, it’s amazing the carb dishes that can be replace by healthy veggies; I truly don’t miss the carbs in recipes like this. Thank you for stopping by for some Platter Talk! This looks like just my kind of thing, that crispy topping is calling my name!! Becca, this was one of my favorite meals from summer. Thanks so much for stopping by for some Platter Talk. We always love hearing from our readers. 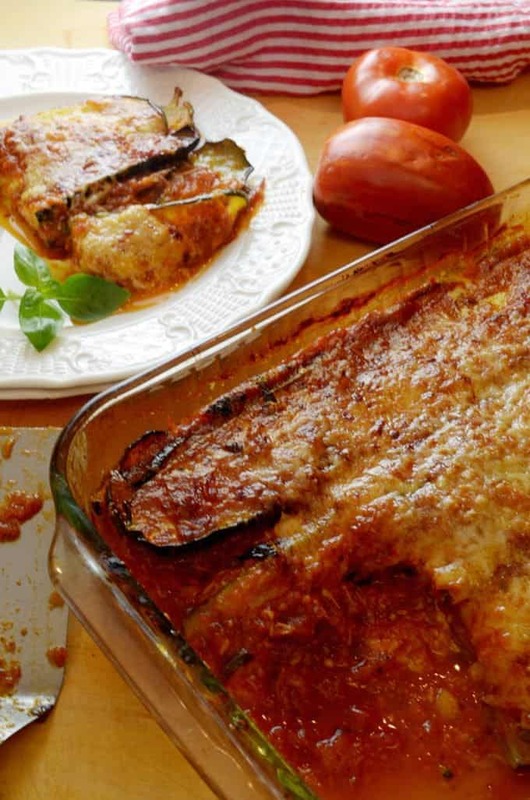 This baked zucchini with parmesan looks delicious! Love that it is carb free! We loved this dish, Divya and thank you for stopping by Platter Talk with your wonderful comments. Elizabeth, we love to share our food; stop by any ole’ time and thanks for leaving such great comments on Platter Talk. This looks delicious! Vegetarian, so it’s perfect for me! And I’ve been trying to cup back on some carbs so that rocks too. I can’t wait to make this. Yum! 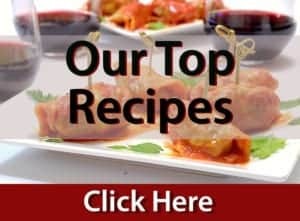 I absolutely love your low-carb option and zucchini is everywhere right now. Pinning!! 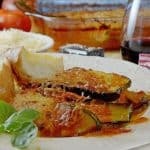 Debra, I hope you give this zucchini recipe a try; I know you will love it! Thanks for stopping by Platter Talk! Thanks so much Andrea; hopefully we can come up with some more good food ideas to help with the never ending battle of the bulge that I seem to have. We really appreciate you stopping by and leaving a comment on Platter Talk! What a lovely way to make the most of fresh zucchini. 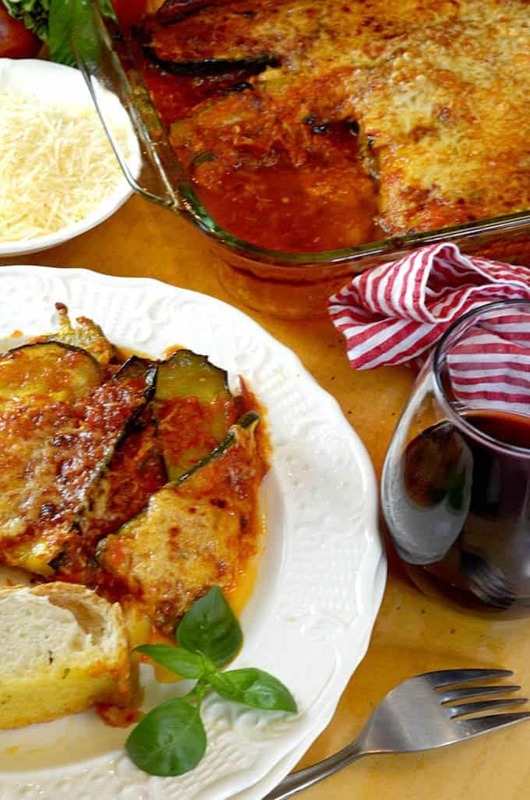 Your Baked Zucchini Parmesan looks delicious – love the wonderful homemade tomato sauce too. There’s nothing like homemade tomato sauce! Stumbled and yummed. Will pin too! April! It’s been so long since we have heard from you and so great to read your comments here on Platter Talk. This zucchini is definitely worth trying soon; thanks so much for dropping by! I love this — cheesy comfort food without all the guilt! Pretty much, Sue! Thanks for stopping by Platter Talk! Umm, yeah…… So confession time, I’m a zucchini freak!! This is everything my like zucchini loving heart desires. Carb free with cheese!!! Thanks, so much Sara. I think this zucchini recipe may be custom built for you! 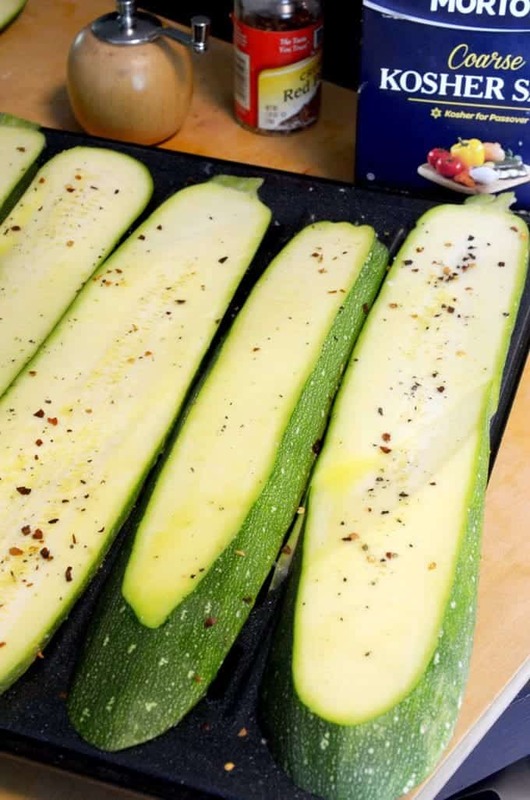 This is a delicious way to serve zucchini, I’m always looking for new ways. I love Italian food and carbs way too much, so I’m happy to have a carb-free option to satisfy my cravings. This looks delicious! Thanks, Jen. I hope you try this, even our kids devoured it! I love fresh produce 😀 especially from my backyard. I must give this a go as soon as the thermometer goes up a notch :D.
Thanks so much, Lisa. We appreciate your comments!